Okay, so we all know that there's a ton of compression garments out there. You see the buzzword slapped all over everything from shorts to socks, but what exactly does it mean? And how do you know it's working? We asked our physical therapist friend, Dr. Kathleen Holden, to try and demystify the process. "Compression is a basic part of the tried-and-true RICE formula," she said. "That's Rest, Ice, Compression, and Elevate. Compression helps the body to decrease inflammation better." Ah. RICE is the acronym you hear barked by trainers all over the world when one of their athletes gets injured. While we're happy to hear that RICE, at least, is one thing about training and physical fitness for the past twenty years or so, we wanted to know what to look for when you go out and search for a compression garment. Turns out, the jury is still out on whether or not compression garments like socks and shorts can help with performance and recovery from everyday workouts. But something like a knee brace with good compression can really make a difference if you're trying tom recover from an injury like a strain or a sprain. So what do you look for in a compression brace? Second, you need to know that compression usually ranges from 10 to greater than 50 mmHg. Third, above 20 mmHg, according to some standards, you should be fitted by someone like a physical therapist. 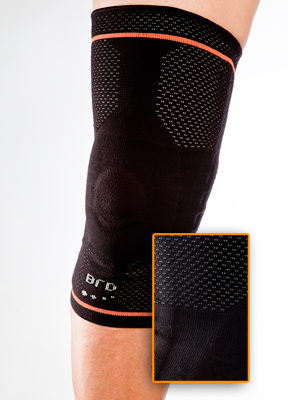 And finally, BRD supports hover right around 2o mmHg--they're made for serious recovery and relief. We want you to recover and train well, so be sure to keep talking to your therapist or doctor about your joints and how you're feeling. Good luck! And leave comments below if you have more questions. We're happy to try and track down the answers for you.